This unit consists mostly of loyal peasant farmers who desire to protect their families and homes while serving. 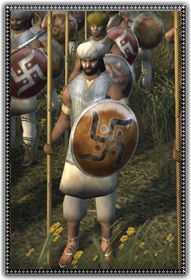 While serving in the Hindu armies, these soldiers try to make best of their situation by arming themselves better than light spearmen and fighting courageously while carrying the Rajput banner of the sun, an important family image. They can be effective against cavalry in appropriate numbers but might flee under overwhelming missile fire.